To complete your rental reservation, please read and e-sign the following rental agreement. This equipment lease is made and effective today, by and between NaperMed, Inc. dba MassageTableRentals (the "Lessor") and the Lessee, who is the person signing this online agreement below. A. You agree to return the equipment clean, and in the same condition as you received it. B. You agree to return it to our warehouse using the tracking label we provide inside the box in a clear plastic sleeve or in another agreed upon format, AND on the date noted on your order. We will help if we can in getting it returned if it's delayed, but the Customer is responsible for the return logistics and any late fees. C. Time is of the essence of this Rental Contract. If you do not receive email notification of your order and ship dates, you agree to call us for this information. If you extend your rental, you agree to pay us with a credit card. If you pay us with a check, your payment is accepted via our e-check service. We do not accept check payments after a rental is shipped and in your possession. Late payments are subject to daily service fees of 5% of your daily rental rate on each piece of equipment rented. D. If your rental will not be returned within 30 days of this order being placed, you agree to put a credit card or bank account routing and account number on file with us. We agree to store it offline in a secure location. You agree to allow us to use it for the security deposit and any fees in violation of this agreement. This equipment lease is made and effective today, by and between NaperMed, Inc. dba MassageTableRentals ("NaperMed") and the Customer, who is the person signing this online agreement below. 1. PARTIES: NaperMed hereby leases to Customer, and Customer hereby leases from NaperMed, the equipment listed in this transaction. If a Customer rents on behalf of a business or company, then NaperMed may work with other persons named on the rental, including the Bill To contact, the Ship To contact, or other assistants or managers of the person placing the order, as required. 2. DATES: The term of this Lease shall commence today, and shall expire on return of the equipment rented. Time is of the essence of this Rental Contract. If you do not receive email notification of your order and ship dates, you agree to call us for this information. 3. PAYMENT: Customer agrees to pay rent to NaperMed for the Equipment IN ADVANCE of rental shipment or pickup. If you pay with a check and the payment does not arrive prior to the rental, we will not ship the rental equipment until the payment arrives and is approved. If your rental will not be returned within 30 days of this order being placed, you agree to put a credit card or bank account routing and account number on file with us. We agree to store it offline in a secure location. You agree to allow us to use it for the security deposit and any fees in violation of this agreement. 4. SECURITY DEPOSIT: Customer shall pay a security deposit of the agreed amount prior to taking possession of the Equipment. The security deposit will be refunded to Customer promptly following Customers performance of all obligations in this Lease. A credit card authorization is available forsecurity deposit purposes. Charges will only be made to the credit card authorized for security deposit if the NaperMed does not comply with the specifications of this agreement. 5. RENTAL POLICIES AND PRACTICES: Customer agrees to all Rental Policies and Practices listed on our website here: http://www.massagetablerentals.com/rental-policies 6. LOCATIONS: Pickup is available at the warehouse location, or at such other place as NaperMed may designate at the time of the rental agreement. Mailing address for NaperMed is 319 N Weber Rd, #142, Bolingbrook, IL 60490. Pickup and Warehouse location may include our Midwest or west coast warehouse locations. Midwest warehouse is 5403 Patton Drive, Suite 202, Lisle, IL 60532. West coast warehouse is 4555 W Ponderosa Way, Bldg. D, Las Vegas, NV 89118. Additional warehouse locations may be available in other cities upon request. 7. NON-WORKING EQUIPMENT: Customer shall notify NaperMed Inc. immediately of any malfunction and/or alleged damage of any Equipment. In the event Equipment is not functioning and/or damaged other than as a result of Customer’s negligence or willful acts, Customer shall have the option of accepting other like Equipment in exchange for such non-working Equipment or returning all Equipment and canceling this agreement should NaperMed Inc. not be able to provide substitute Equipment in a timely fashion. The rental charges for all such non-working Equipment so returned to NaperMed Inc. shall be abated from the time of acceptance and return to NaperMed Inc. Likewise, rental charges shall accrue and be owed for any replacement Equipment. 8. RENTAL EXTENSION: If you extend your rental, either by calling to do so, e-mailing to request it, or keeping equipment without calling us, you agree to pay us with a credit card or a check. If you pay us with a check, your payment is accepted via our e-check service. We do not accept check payments after a rental is shipped and in your possession. Late payments are subject to daily service fees of 5% of your daily rental rate on each piece of equipment rented. Any payment not made by the agreed return day shall be considered overdue and in addition to NaperMed's other remedies. NaperMed may levy a late payment charge equal to five percent (5%) per day on any overdue amount. Rent for any partial week or month shall be prorated, based on the standard rates per day, week or month listed on the massagetablerentals.com website. 8b. We work with FedEx or couriers to deliver and pick up the rental equipment. If you do not properly prepare the rental equipment by labeling it for shipment, or do not make it available to the carrier (labeled and ready) at the specified pickup location in your order, or do not drop it off at a shipper location agreed upon, you are responsible for the extension of your rental. 9. LEGAL HANDLING: Customer shall use the Equipment in a careful and proper manner and shall comply with and conform to all national, state, municipal, police and other laws, ordinances and regulations in any way relating to the possession, use or maintenance of the Equipment. 10. THEFT, LOSS AND DAMAGE: It is the Customer’s responsibility to prevent the theft of the equipment and, if any of the equipment is stolen while in the Customer’s possession, Customer agrees to pay thereplacement cost of same item and parts if stolen. Customer shall properly secure or lock all rental equipment in legal locations when not in the Customer’s possession. Customer hereby assumes and shall bear the entire risk of loss and damage to the Equipment from any and every cause whatsoever. Customer assumes all risk of loss or damage to rented Equipment whether or not covered by Customer’s insurance. No loss or damage to the Equipment or any part thereof shall impair any obligation of Customer under this Lease, which shall continue in full force and effect through the term of the Lease. In the event of loss or damage of any kind whatever to the Equipment, Customer shall pay to NaperMed the replacement or repair cost of the Equipment. Customer shall assume liability for any and all damage or loss to personal property, accident/injury to other persons related to the rental equipment. 11. EQUIPMENT CONDITION: Customer shall keep the Equipment in good repair, condition and working order. Customer agrees to return equipment clean and free from grit, dirt, and debris. Equipment shall be returned free of any tears, breaks, and include all parts and pieces such as knobs, straps, cases, attachments, clips, etc. Missing or damaged parts are replaced or repaired at the discretion of the NaperMed if Equipment is not returned in the same quality condition it was in prior to rental. Repair or replacement fees will come from the Security Deposit, or may be billed after the event to the Customer. NaperMed may levy a late payment charge equal to five percent (5%) per day on any overdue amount. Rent for any partial week or month shall be prorated, based on the standard rates per day, week or month listed on the massagetablerentals.com website. A service fee for cleaning will be incurred for each piece of equipment returned with excessive dirt or residue. You agree to all fees for missing or damaged parts if we need to furnish any and all parts, mechanisms and devices required to keep the Equipment in good mechanical working order. 12. LATE PAYMENT: Any payment not made by the agreed return day shall be considered overdue and in addition to NaperMed's other remedies. NaperMed may levy a late payment charge equal to five percent (5%) per day on any overdue amount. Rent for any partial week or month shall be prorated, based on the standard rates per day, week or month listed on the massagetablerentals.com website. To avoid these fees, the Customer agrees to inform us of any delays or rental extensions and provide payment. If Customer fails to pay any rent or other amount herein provided within ten (10) days after the same is due and payable, or if Customer fails to observe, keep or perform any other provision of this Lease required to be observed, kept or performed by Customer, NaperMed shall have the right to exercise any one or more of the following remedies: To declare the entire amount of rent hereunder immediately due and payable without notice or demand to Customer; to sue for and recover all rents, and other payments, then accrued or thereafter accruing; to take possession of the Equipment, without demand or notice, wherever same may be located, without any court order or other process of law; to terminate this Lease; to pursue any other remedy at law or in equity. Customer hereby waives any and all damages occasioned by such taking of possession. Notwithstanding any repossession or any other action which NaperMed may take, Customer shall be and remain liable for the full performance of all obligations on the part of the Customer to be performed under this Lease. All of NaperMed's remedies are cumulative, and may be exercised concurrently or separately. 13. TITLE: Customer specifically acknowledges NaperMed’s superior title and ownership of the Equipment and must keep the Equipment free of all liens, levies and encumbrances except those caused by or resulting from NaperMed acts. Customer may not assign or pledge the Equipment. 14. WARRANTY: NaperMed disclaims any and all other warranties, express or implied, including but not limited to implied warranties of merchantability and fitness for a particular purpose, except that NaperMed warrants that NaperMed has the right to lease the equipment, as provided in this lease. 15. TAXES, OTHER FEES, RENTALS: Customer, or NaperMed at Customer's expense, shall report, pay and discharge when due all license and registration fees, assessments, sales, use and property taxes, gross receipts, taxes arising out of receipts from use or operation of the Equipment, and other taxes, fees and governmental charges similar or dissimilar to the foregoing, together with any penalties or interest thereon, imposed by any state, federal or local government or any agency, or department thereof, upon the Equipment or the purchase, use, operation or leasing of the Equipment or otherwise in any manner with respect thereto and whether or not the same shall be assessed against or in the name of NaperMed or Customer. However, Customer shall not be required to pay or discharge any such tax or assessment so long as it shall, in good faith and by appropriate legal proceedings, contest the validity thereof in any reasonable manner which will not affect or endanger the title and interest of NaperMed to the Equipment; provided, Customer shall reimburse NaperMed for any damages or expenses resulting from such failure to pay or discharge. Customer shall keep the Equipment free and clear of all rents, levies, liens and encumbrances. In case of failure of Customer to procure or maintain said insurance or to pay fees, assessments, charges and taxes, all as specified in this Lease, NaperMed shall have the right, but shall not be obligated, to effect such insurance, or pay said fees, assignments, charges and taxes, as the case may be. In that event, the cost thereof shall be repayable to NaperMed with the next installment of rent, and failure to repay the same shall carry with it the same consequences, including interest at ten percent (10%) per annum, as failure to pay any installment of rental amount. 16. DEFAULT: In the event that Customer (a) fails to make payment when due hereunder, (b) becomes insolvent, files a petition in bankruptcy, seeks the appointment of a receiver (or has a receiver appointed) for all or a substantial portion of its property, or has an involuntary petition in bankruptcy filed against it, Customer shall be in default hereunder. Upon such default, NaperMed may, in its sole discretion, terminate this rental agreement and, and to the extent permitted by law, immediately repossess the Equipment without any prior notice to Customer, the receiver, bankruptcy trustee, assignee for the benefit of the creditors, or levying officer. Customer hereby grants to NaperMed the right and permission to lawfully enter the Customer’s premises where the Equipment is kept following any such default for the purpose of repossessing the Equipment without liability of trespass or any liability for any damage that might occur as a result of such entry. 17. INDEMNIFICATION: Customer shall indemnify NaperMed and its officers, employees, agents and licensees against, and hold NaperMed harmless from, any and all claims, actions, suits, proceedings, costs, expenses, damages and liabilities, including reasonable attorney’s fees and costs, arising out of, connected with, or resulting from Customers use of the Equipment, including without limitation themanufacture, selection, delivery, possession, use, operation, or return of the Equipment. Customer shall indemnify, defend and hold harmless NaperMed and its officers, employees, agents and licensees from any and all claims, actions, damages, liabilities and expenses arising from the use, possession or operation of the Equipment and by whomsoever operated at the direction of the Customer, including Customer’s breach of any representations or warranties made herein, or from the negligence or willful conduct of Customer, its employees, agents or contractors. This indemnification shall survive the term of the rental agreement. NaperMed agrees to indemnify, defend and hold harmless Customer and its officers, employees, agents and licensees solely as respects bodily injury and property damage claims, actions, damages, liabilities and expenses arising from NaperMed’s negligence or willful misconduct of NaperMed, or that of NaperMed’s employees, agents, or contractors, NaperMed not having the right to rent the Equipment. This indemnification shall survive the term of the rental agreement. 18. ASSIGNMENT OR TRANSFER: Neither this Lease nor any interest therein is assignable or transferable by operation of law. If any proceeding under the Bankruptcy Act, as amended, is commenced by or against the Customer, or if the Customer is adjudged insolvent, or if Customer makes any assignment for the benefit of his creditors, or if a writ of attachment or execution is levied on the Equipment and is not released or satisfied within ten (10) days thereafter, or if a receiver is appointed in any proceeding or action to which the Customer is a party with authority to take possession or control of the Equipment, NaperMed shall have and may exercise any one or more of the remedies set forth in Section 14 hereof; and this Lease shall, at the option of the NaperMed, without notice, immediately terminate and shall not be treated as an asset of Customer after the exercise of said option. 19. RENTAL AGREEMENT AND ELECTRONIC AND NON-ELECTRONIC COMMUNICATION: Customer agrees that our online electronic rental agreement holds the same value as a paper signed agreement. Verbal agreement to this rental agreement when placing a phone order confirms agreement with all parts of this rental agreement. This agreement is available online at all times for review and printing, and is subject to change at any time by NaperMed, Inc. without notice. The unlimited use of comments, testimonials, communications and feedback may be used by NaperMed to improve service and maintain high standards, and for marketing materials including but not limited to advertising, letters, and all forms of media. 20. ASSIGNMENT: Customer shall not assign this Lease or its interest in the Equipment without the prior written consent of NaperMed. 21. VALIDITY: The invalidity or un-enforceability of any provision in this Agreement shall not cause any other provision to be invalid or unenforceable. 22. GOVERNING LAW: This Lease shall be construed and enforced according to laws of the State of Illinois. This instrument constitutes the entire agreement between the parties on the subject matter hereof and it shall not be amended, altered or changed except by a further writing signed by the parties hereto. The parties hereto have executed this Lease as of the date and year this agreement is submittedonline and agreed to via the Agreement button. Customer agrees that the completed Bill To Name, Title, Address and Contact information provided is that of the Customer. 23. ENTIRE AGREEMENT: Customer agrees that they have read and fully understand and accept all provisions of this agreement prior to executing this agreement. The signed Rental Contract together with these Terms and Conditions constitute the entire agreement between NaperMed and Customer. In the event of conflict between any terms or provisions of the Rental Contract and these Terms and Conditions, the terms and provisions of these Terms and Conditions shall govern and control. Any changes must be made in writing and signed by both parties. If Customer is a corporation or other entity, the person executing the Rental Contract represents and warrants that he/she has full power and authority to execute the Rental Contract on behalf of the entity and bind such entity to the agreements, terms and conditions hereof. Customer acknowledges that a photocopy or electronic version of this document shall constitute the same consent as an original. Welcome to MassageTableRentals.com, a NaperMed Company! We want to offer a few guidelines to our rental customers. We are here to help with your event, and to provide you with high quality, well- maintained rentals delivered on time to your venue. The following guidelines address common questions about the rental process, and includes rental for every type of product, including tables, chairs, chaises, stools, etc. 2. Courier services to special locations, including indoor and outdoor venues in most US locations. We also provide information needed to assist you with managing security at events, white glove setup when available, notifications, changes, handling bad weather or other problems, and other courier communications and support services. 3. Multiple warehouses in the USA, which allows us to ship equipment to anywhere in the lower 48 United States in 2-3 business days. We ship during our regular business hours of 8 am - 4:30 pm Monday - Friday. 4. Online ordering, with a history of invoices, printable PDF format invoices, tracking, and order notes and updates. 5. Free online quotes and rates. Use our shopping cart "Get a Quote" tool, 24 hours a day, 7 days a week, 365 days per year. We also use this tool to get you pricing when you call us to get information orplace a phone order. Our website serves as our live ordering tool for both our customers and our customer service team. We get up to the date rates from FedEx using our website tool, to help you save on shipping. 6. Help, using instructions on the packages and also via email, when you are ready to return your rental. We often schedule pickups for the return, and can assist you with getting the boxes back into the FedEx system. It's our goal to help you achieve a smooth and successful event or rental activity, and impress you with our service as well as our high quality, well-maintained rental equipment. 7. A 9-point inspection and cleaning process after each rental, allowing you to trust that the equipment you are renting is well maintained for your event. If you do experience a quality problem, we will do our best to support your needs and make it right. We rent on a first come, first served basis. The earlier you order, the earlier we put your order on our warehouse calendar, and plan around it. All orders that come after yours are subject to availability, based on the date of your order. We do not reserve equipment for a possible order, but do reserve equipment for a paid order. Many of our customers order weeks and months prior to the event, so they have their order in the system and on our shipping calendar. This ensures we have the equipment they need ready well in advance. We do have a large stock of equipment, but it is possible for your first choice equipment type to run out of stock. The earlier you order, the better your chances that you will receive the equipment you prefer for your event. Keep in mind that the larger, more costly tables to rent are also more costly to ship as you consider your event budget. Rental Orders placed after 12 pm Central Standard Time will be charged a Same Day Rush Fee if the order needs same day shipping during our regular business hours 8 am - 4:30 pm Monday - Friday. If you change or correct an address that a shipment is going to after it has shipped from our warehouse, we are happy to order the change from FedEx. However, once the packages are in transit, even if you are charged and pay for the change, the guarantee that the packages will deliver on time is no longer valid. It is FedEx's policy that a change in address can delay a shipment 24-48 hours, and this may affect whether the equipment arrives on time for your event. If the equipment does not arrive in time after you make the change, we are not able to refund any rental or shipping fees. This is because we filled the order correctly and shipped the equipment as ordered. While we realize this may be inconvenient for our customers and do not want them to be unhappy, once we release the shipment, we have a limited amount of control over the outcome. If the equipment is refused at the event site, the renter will still be responsible for the shipping and rental charges. If you lose a box or a label provided inside the box, we can assist you with a new label, but we cannot provide a new box. There are fees for shipping back without a box, detailed here: http://www.massagetablerentals.com/fedex-special-services.html . We will provide a label for you at no charge, but keep in mind that this may delay your return and make it subject to additional rental charges. For orders of 1 to 4 rental items, we ship with FedEx Ground, Express our courier services. The order can be canceled if it has not yet shipped. However, once the equipment is handed off to the carrier, we cannot stop the shipment. The equipment also needs to arrive 1-2 days prior to the rental day. That means it will ship 2-5 days prior to the event. You can check the order processing notes put into every order to identify the shipping and arrival dates planned for your rental. Since we are not a walk-in rental service for most of our orders, and we ship the equipment you rent, these orders cannot be canceled once they leave the warehouse. We can work closely with you and FedEx or the courier service and plan carefully as we manage the preparation of your order for event delivery. We strive to deliver good service, and appreciate your help in planning a smooth and organized delivery and return. For orders of 5 or more tables, we plan for 1 preparatory day in the warehouse, a pickup day by the carrier, and 2-3 days in transit. The equipment also needs to arrive 1-2 days prior to the rental day for volume orders. For orders of 5 or more tables, please provide 7 days notice before the event date to receive a full refund. For advance orders of 15 or more tables, please provide 14 days notice if possible. Orders that are completely canceled without these notice guidelines may be subject to a 10% late cancellation fee. Since we are not a walk-in rental service for most of our orders, and we ship the equipment you rent, the late cancellation fees cover staff time associated with preparing to ship and fulfill orders at the desk and at the warehouse, especially when organizing large volume orders. We can work closely with you and FedEx or the courier service and plan carefully as we manage the preparation of your order for event delivery. We strive to deliver good service, and appreciate your help in planning a smooth and organized delivery and return. Adding additional rental units to the first order is common and easy to do. We can create an add-on order for additional equipment once your primary order is in the system. For example, if your first orderis #100000333, we can use a later order number to add more tables to the original order number 100000333, and increase the quantity of rental units. You will have two invoices for your event, but the add-on order ensures you get all the equipment you need added to an earlier paid reservation, and the warehouse preparation is already occurring. Reducing the quantity of rental units for your order, also known as Partial Cancellation, requires notice to us prior to shipping your order to avoid fees. If the order ships out at the originally ordered volume, the order can no longer be reduced. We do not ship rental orders of less than $10,000 without payment prior to the order shipping. We can accept a purchase order to confirm the event details, but we cannot ship the rental until the rental fees are paid. If your order is over $10,000 and you are ordering from an estabilshed institution, we may be able to approve terms for the rental payment. We would need a plan for the security deposit in place as well, including the use of a credit card, or a check for the deposit amount. Please Contact Us if you need help with a rental order that may be more than $10,000 in total. All orders are placed on our website, so the person placing the order receives an immediate record of the order number and order details. 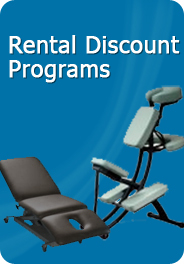 To retrieve an invoice, simply log in to www.massagetablerentals.com and view your order history. Look for the button to view the order as a PDF to print your invoice. We accept Visa, MasterCard, Discover, and American Express. When using these forms of payment, the order payment is processed live as you place your order. If there is a problem with the payment, the system may decline the card. If so, please check with your card issuer (your bank) to resolve any possible causes for the processing error. If we can assist you, please Contact Us. We accept debit cards in our system, and they process like a regular credit card. We cannot tell when a card is a debit or credit card - it all looks like a credit card to us. When using debit as your form of payment, the order payment is processed live as you place your order. For rental orders, that means that you will see what looks like a charge for the rental and shipping amount, showing as a total on the bottom of the order. You will also probably see the security deposit appear as a charge on your card. Our system puts a hold on your credit line for the security deposit automatically. This is not a manual task here at MassageTableRentals.com. Using a debit card for payment of rental orders may be inconvenient for some customers, as it ties up actual cash for the security deposit. If you would like to pay by check, we are happy to accept this form of payment. Your check payment needs to arrive before you rental order ships. You can place the order yourself online, which helps ensure accuracy. Also, one of our team members can place the order via the massagetablerentals.comwebsite. You will receive an email copy of your order, including the address to send your payment to. Please reference the order number on your check. We strongly suggest that you provide a "backup" credit card for your file also. This allows us to authorize the security deposit amount against the card on file. The credit card also provides a backup form of payment should the check not arrive on time. You may also opt to pay the deposit with a check, which we will then deposit here, and refund once the equipment is returned and inspected. We issue deposit refunds when the refund was paid by check in 1-10 days after the equipment is received back and inspected by the warehouse. We use a security deposit to cover possible loss, damage or missing parts if your equipment returns missing or broken. We need to replace broken or missing items quickly, so we can fill other customer's rental orders. You may provide a check or a credit card for the security deposit. Checks are deposited by us, and refunded back by check after the rental is received back and inspected. Credit cards are authorized for the deposit amount, and not charged unless there is loss or damage created by the renter. Authorizations on a credit or debit card can last from 3 to 30 days, depending on the rules of the bank that issues the card you use for payment. Contact your issuing bank for more information about how authorizations are handled for your credit card account. You will not be billed for any damage created by the shipping carrier. Thank you for choosing MassageTableRentals.com! If we can help you further, please call us at 800-687- 5199, or Contact Us. We look forward to working with you! To complete the rental agreement, please fill in your name and billing information below. I understand that the cutoff time for renters picking up and dropping off is 12 noon, and late drop-off or early pickup may result in charges for additional days without specific permission for a different pickup or drop-off time. or fax the Charge Information Form after you click Agree below. Our phone number is also shown at the top of every page on our web site.